In spite of millions of dollars that have gone into market linkage initiatives in developing countries over the past few years, farmers still struggle to sell their commodities profitably. Post-harvest losses have not gone down, gluts continue to alternate with shortages and relationships between farmers and processors have not improved. This suggests market linkages is half the story unless the entire agricultural ecosystem including financial liquidity in different markets is fully understood. One of the critical issues that has not been solved through market linkages is the difference between farm gate price and market price. This is not only vexing smallholder farmers but some of the most sophisticated commercial farmers often struggle to determine their farm gate price in ways that ensure profitability. The notion of farm gate price does not seem to exist in most smallholder farming communities because each farmer may have a different price depending on distance to the main road and local markets, among other factors. Many farmers who call eMKambo asking for prices of different commodities use feedback from such enquiries to try and set their own prices. This implies farm gate prices are not readily available but externally-determined in ways that expose farmers to manipulation. Disputes surrounding contracts between farmers and contract companies stem from the fact that contractors have most of the information for accurate decisions making. For instance, they know their profit margins while farmers are not privy to most of these details. Ideally, market linkage interventions should ensure farmers have their own negotiation instruments which they pull out when negotiating contracts with private companies. Since most farmers do not have information on up-markets and the entire agricultural ecosystem, this fuels their suspicion that whoever comes to buy from them is going to make a killing through abnormal profits. In an unregulated market, middlemen cannot resist the temptation to take advantage of uniformed farmers. There is need for a partnership model in which profit-sharing models are embedded, clarifying information about formal and informal markets. The open market tends to be more transparent than other markets because everyone can see what is going on. If the price is unviable farmers cannot force a trader to take more than 20 crates of tomatoes. All contracts should have enough flexibility that takes into account market variations. The time lag between signing a contract and marketing should be carefully factored in. This issue can be legislated to accommodate price variations. For instance, it can be set at between 10 – 30% such that if the market goes down, farmers can receive 10% bonus and if it goes up, farmers can receive 30% bonus. This arrangement should also consider other external factors like inflation, costs of inputs during production and other variable costs. For instance, the cost of labor can suddenly increase and affect the original contract. At the moment, it is not known how much a farmer should put in to make a profit in potato production from different production zones. Budgets should not be generic but tied to specific niche markets like processors, food chain stores or informal markets. Some buyers end up offering low prices due to costs incurred along the value chain. All elements of production should be put together and scenarios provided, taking into account different elements. For instance, farmers should look at options in case they see viability in providing their own transport, packaging and different sources of labor. In almost all African countries, crop budgets are set per hectare without looking at other elements that are sources of differentiation. Budgets should be fluid to accommodate the changing economy. For instance, fuel and electricity costs keep changing and this should be factored in. On the other hand, farmers who do not use electricity to irrigate have different costs from those who do and that translates to different profit levels. A system of managing, tracking and updating production budgets for different contexts is important. The return on investment (ROI) in each production zone should be clear. Currently, there are no elements or mechanisms for price negotiation or control in horticulture, taking into account issues like distance, road networks and other factors. In Zimbabwe, a budget for Mazowe and that for Nyanga cannot be the same if the commodity end up sold in one market like Mbare in Harare. However, Nyanga may have superior climate like good soil and technology for potatoes compared to Mazowe, such that even if Mazowe can be closer to the market, Nyanga farmers can still compete and be profitable. Nyanga may require different inputs from Mazowe in ways that make both places profitable in different ways. Farmers should be empowered to evaluate information and knowledge for correct decision making. The breadth and depth of existing knowledge networks from production areas to diverse markets should provide a stronger social safety net for farmers. Different markets can provide dependable information nodes and networks where it is possible to know demand patterns of various commodities. 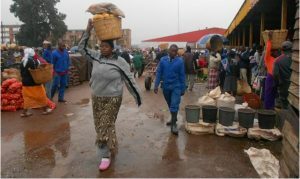 Consumers, farmers, transporters, small scale processors, caterers and other actors would not be flocking to informal open markets if these markets were not dependable. Beyond market linkages, classifying niche markets can enable farmers to make sense of different transaction modes. While the open market tends to prefer cash, different transaction modes have their advantages and disadvantages. A buyer who pays farmers after 30 days gives consumers time to buy. It takes 30 days for traders and retailers to pull income from different consumers and put a little mark-up. The time lag between selling and consumption has to be understood by farmers, most of whom want to be paid immediately and pass on all risks associated with the slow movement of commodities to traders. The trader ends up waiting for consumers to buy before returning to farmers for repeat purchases. Why should financial institutions understand these market dynamics? Financial institutions need to understand these dynamics if they are to remain relevant in agile agricultural ecosystems. For instance, they need to know that aggregators or traders who buy agricultural commodities from diverse farmers and supply in bulk also require long-term finance so that they can sustainably satisfy different niche markets. Such long-term financing should have a component of exploration. A trader should be able to use that money for market research like visiting regional and international markets to find out gaps and needs. Unfortunately, at the moment, most financial packages in Africa do not have a component of exploration and capacity building. The assumption is that the borrower has already done research using his or her own resources yet circumstances are rapidly changing such that continuous evidence gathering will benefit every actor. This entry was posted in Agricultural Markets, eMKambo, health and agriculture, ICTs and agriculture, Knowledge Transfer Africa. Bookmark the permalink.